A strong earthquake has been clearly felt on the Shetland island of Unst. The earthquake in the Norwegian sea, measuring 4.9 on the Richter scale, was felt at about 0150 GMT on Sunday. 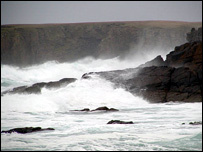 The epicentre of the early morning earthquake was said to be about 200km north east of Shetland. A spokesman for the British Geological Survey (BGS) said it was the largest earthquake of its kind in the area for 10 years. An earthquake measuring 3.5 on the Richter scale shook parts of Dumfries and Galloway on Boxing Day.